The London hot sauce scene (yes, that’s a thing) is booming. Back in the day we’d have to make do with the three offerings at Nando’s or the splodge that came alongside the garlic sauce with a 2am kebab. Now, we have a selection of independent producers, street food stalls and even chain restaurants knocking out great examples. It’s time to support the homegrown talent. Go forth and sweat! You’ve heard of this one, right? No? Where have you been? Mark Gevaux is an ex-butcher turned rib-roll-slinger who took up hot sauce production. 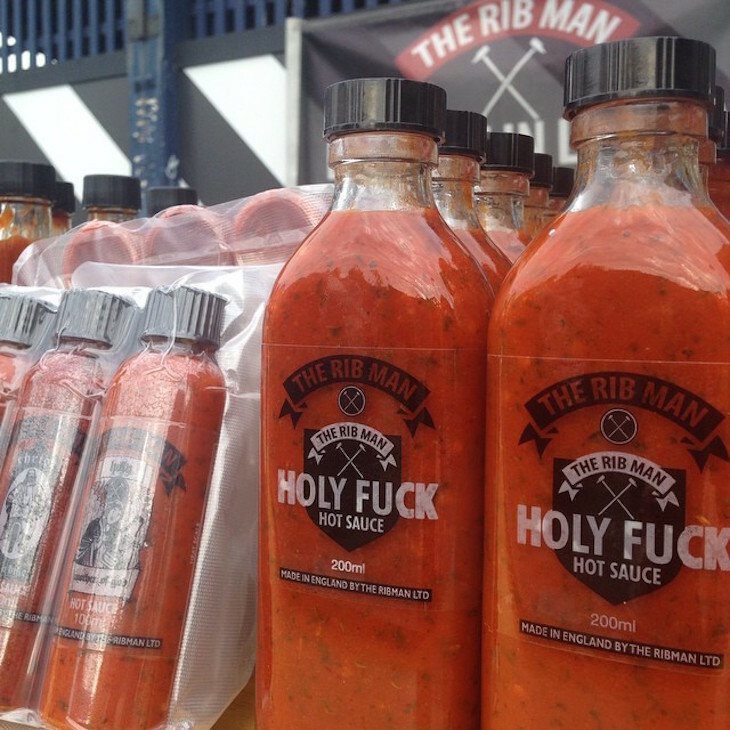 His customers couldn’t get enough of the sauce at his Brick Lane rib stand, so he now sells four varieties. The original Holy F*ck is so named because, well, you can probably guess that it doesn’t pull any punches. Mark somehow manages to capture the fruity flavours of the scotch bonnet chilli, and the even harder to harness fragrance of the naga jolokia. In case you’re not familiar, the latter is what can be described as a ‘serious’ chilli; this sauce is hot, yes, but it’s also damn addictive. Those dollops get bigger and bigger every time you use it, so watch your step. Ahem. For online purchase and stockists see theribman.co.uk. A new player on the hot sauce scene this one, from Fred Smith, development chef and all-round burger genius at the Byron restaurant chain. We know that this hot sauce has been a while in the making, and it’s great to see it finally hit the tables. You’ll find the flavour of fire-roasted red peppers, plus a chilli bang of red chillies, arbol chilli flakes, habanero and smoky chipotle. The excellent final touch here though is a sprinkle of cumin, which brings some lovely toasty warming flavour to the mix. We’re glad to see this replacing the Cholula that has been resident at Byron for so long; as much as it’s a good all-round hot sauce, Fred's version is a great all-round hot sauce. It’s available in all branches of Byron and you can purchase your very own bottle to take home. 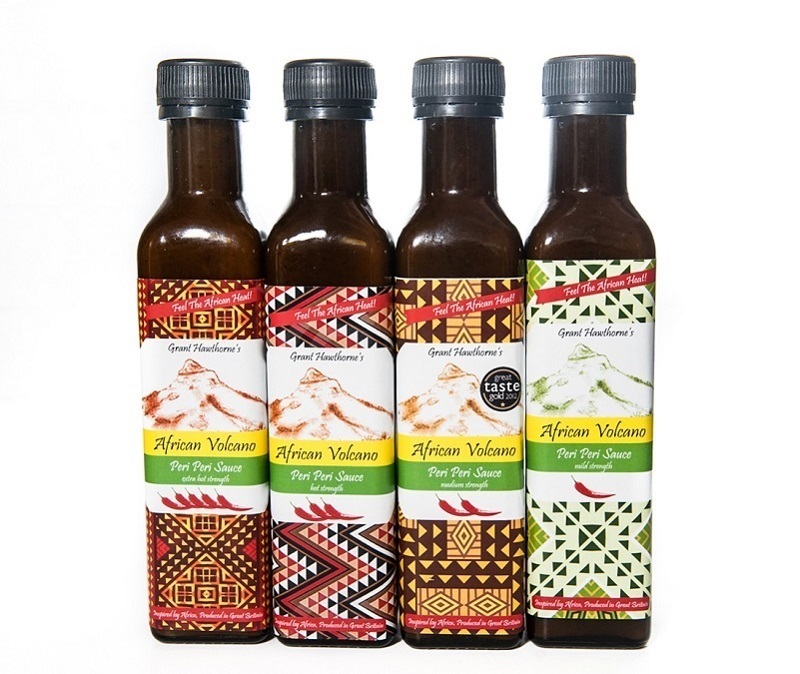 Originally from South Africa, the now-London-based chef Grant Hawthorne makes three different strengths of hot sauce under the brand name African Volcano. For more than 15 years he has been tweaking his recipe, which was gifted to him by a lady from Mozambique. These excellent sauces are, in Grant’s words, about “flavour first, heat second.” He uses a variety of chillies including the African Bird’s Eye, fruity Scotch bonnet, the fearsome Dorset Naga (one of the World’s hottest) and the Facing Heaven chilli (so called because it grows – you’ve guessed it – facing upwards). What we love most about these sauces is the versatility (honestly, you could chuck this stuff on anything; and you will) and the fact that the sauce isn’t just vinegar-based - those bottles are packing some major chilli flavour, along with onion, garlic, tomato and herbs. Respect. Available to buy at Maltby Street Market, online or from a range of other stockists (see website for details). See website for restaurant locations. And while we’re talking about chilli oils, this is a gorgeous example from the sushi chain Tsuru. 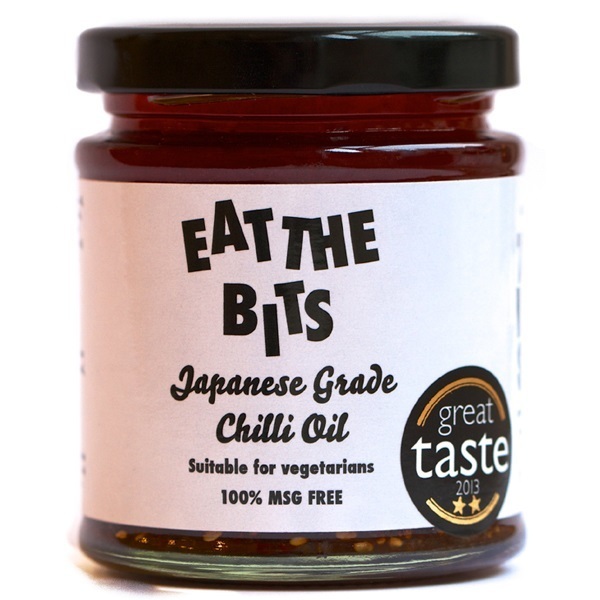 As you may have guessed from the name, it’s the ‘bits’ that make this oil special. There are chilli flakes (duh), plus shichimi togarashi, a Japanese spice mix made with orange peel, sesame seeds and...yep, it’s more chilli. Together with garlic, onion and the funky, savoury punch of red miso, this is not to be missed. Use it to make dressings, dips, drizzles or dribbles. It’s a game-changer for the condiment collection. Buy at branches of Tsuru or see website for stockists.